TBI (traumatic brain injury) and hyperbaric oxygen treatment. This is a dual person soft chamber hbot unit. An estimated 1.7 million Americans suffer a traumatic brain kinjury (TBI) annually. Roughly 80% of these patients are diagnosed as mild TBI, or having a head injury that did not result in a coma. 250,000 of these brain injuries are in children from sports and recreational activities. These mild TBI or concussion sufferers are treated and released from the emergency room and typically get better in a few weeks, but up to 20% continue to have persistent symptoms for months or even years. These symptoms can include: headaches, dizziness, cognitive issues (poor focus, retention of information, inability to multitask, decreased memory, etc. ), anxiety, depression, fatigue, light and noise sensitivity, irritability and so on. Persistent symptoms after a mild TBI is known as post- concussion syndrome or PCS. Having just 1 concussion increases the risk for further brain injury if another concussion is experienced. The risk further increases for each sequential concussion. Despite the epidemic of TBI’s, research to date has few treatment options available. Currently, at Jupiter Medical Center in Florida (Joe Namath Neurological Research Center) a TBI clinical trial is underway with the goal to determine if Hyperbaric Oxygen Treatment (HBOT) can have a significant impact on reversing damage from head trauma so the treatment can become standard practice for patients suffering from TBI. Joe Namath aka Broadway Joe, the charismatic quarterback for the New York Jets suffered brain trauma due to his years of playing football and underwent HBOT treatment with very positive results. Joe had heard too many stories of CTE (chronic traumatic encephalopathy) in his peers and was concerned he too, suffered from chronic brain injury. Unfortunately, CTE cannot be diagnosed except in an autopsy so Joe decided to be proactive and underwent HBOT sessions regularly while having SPECT scans (single positron emission CT scan) performed to evaluate his progress. The SPECT scans, which are more functional than a regular CT scan, showed improved blood flow to Joe’s brain as well as improved function in areas that were previously under functioning. Joe reported a better memory, improved energy and performed better on cognitive evaluations. 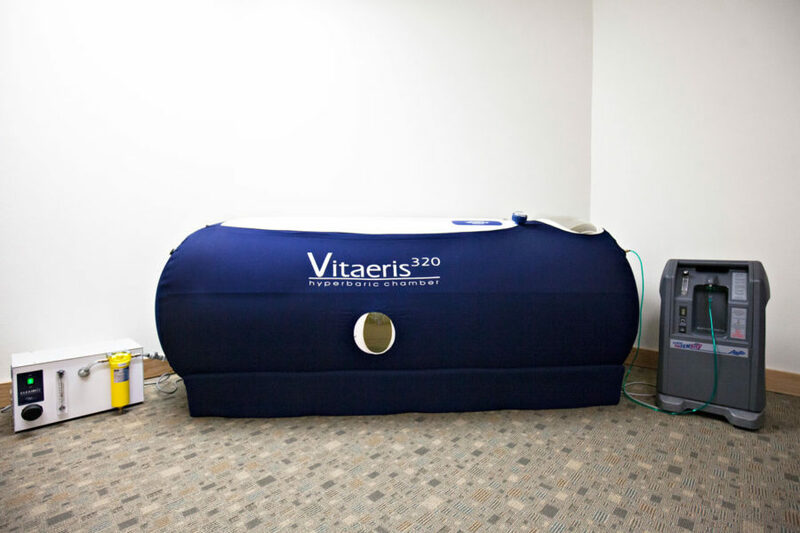 HBOT treatment is performed in either a mono chamber or a multi person chamber. It can be done in a soft chamber or a hard chamber. Hard chambers have the capacity to use higher pressures than soft chambers and would be more appropriate with diving injuries aka “the bends.” For most other diagnoses including TBI soft chambers are effective. The treatment consists of about an hour lying in a large tube that pressurizes the chamber to the equivalent of 1.3 ATA or the feeling of being about 10-12 feet underwater. It is perfectly comfortable except for a little ear popping like on an airplane, when the chamber is pressurized and then depressurized. The cost is anywhere from $50.00 to 200.00 per session. It is not covered by insurance for TBI yet. HBOT treats the underlying pathophysiology of TBI and concussion. Paul Harch, MD in New Orleans, a leading researcher has used HBOT for 30 years to treat hundreds of people with chronic brain injury, stroke, drowning, Alzheimer’s, etc. Dr. Harch says HBOT works through several biological pathways. The increased oxygen appears to trigger healing of brain cells and switches on genes specifically related to brain repair. It also increases the number of stem cells that migrate to sites of brain injury, promotes the growth of new blood vessels in the brain and boosts mitochondrial activity. In addition, HBOT decreases inflammation and can stimulate neuroplasticity (the brain’s ability to change, adapt and grow). Shai Efrati, MD a physician and researcher in Israel is a leading hyperbaric scientist. Dr. Efrati says the brain is no different from any other part of the body. Pressurized oxygen has the power to repair many kinds of tissue damage. HBOT is currently FDA approved to treat diabetic wounds that won’t heal and bacterial infections like necrotizing fasciitis (aka flesh eating disease) so treating the brain is a logical segue. Efrati and colleagues in Oct. 2017 treated 15 post-concussion syndrome patients with HBOT and results showed increased brain blood flow and more activity in brain areas that were previously dormant as well as improved memory and processing speed. In a 2015 study by Dr. Efrati, 56 patients with PCS had improved cognitive function and improved overall quality of life. Dr.’s Efrati, Harch and others say injured brain cells don’t die but may “idle” (lie dormant, alive but hobbled) and persist for years or even decades which is why they see positive results with HBOT even many years post initial brain injury. Critics argue HBOT remains unproven for use in brain injury like concussion (although approved for use in multiple other diagnoses) and patients are wasting their money. A review of the literature using HBOT for TBI shows mixed results. In the studies stating placebo was as good as treatment doses of HBOT, placebo was considered 1.3 ATA which has been shown in other studies to be a therapeutic dose! Perhaps it wasn’t a placebo after all. In other studies not showing a positive response, perhaps the therapeutic dose was too high (2.0 ATA) for the condition? Overall little, research on HBOT for brain injury is occurring because pressurized oxygen can’t be patented which limits potential profitability. (The Joe Namath study is relying on donations). HBOT has been approved by the FDA for 50 years for multiple diagnoses. When soft chambers are used, it is safe, theoretically sound, cost effective and in my opinion the best available treatment for TBI and concussion. I would hands down recommend it to anyone who has suffered a concussion until their symptoms cleared (as well as a dose of the homeopathic remedy arnica montana😊). We're open Monday — Friday. "I can't say enough. I'd had some recurring issues—not super serious—but tiresome and really challenging. What I liked most was that my doctor took quick action. In no time, I was on an entirely different diet (still on it two years later) and she uncovered an underlying problem and we tackled that, too. I'm so grateful. "